At Tribune Bay Outdoor Education Centre (TBOEC) guests have a few options on accommodation and amenities during their stay. Guests can choose to camp or stay in cabins, cook their own food or have food cooked by our chef at our historic lodge, which was built around the 1870s. Our historic lodge has gone through more than 100 years of history. Initially built as a family home, the lodge was also run as a summer resort, accommodating sixty guests at a time. In 1979, the provincial government purchased the land and turned it into Tribune Bay Provincial Park. Around 1988, TBOEC started renovating and rebuilding the site, slowly developing it into an outdoor education facility. 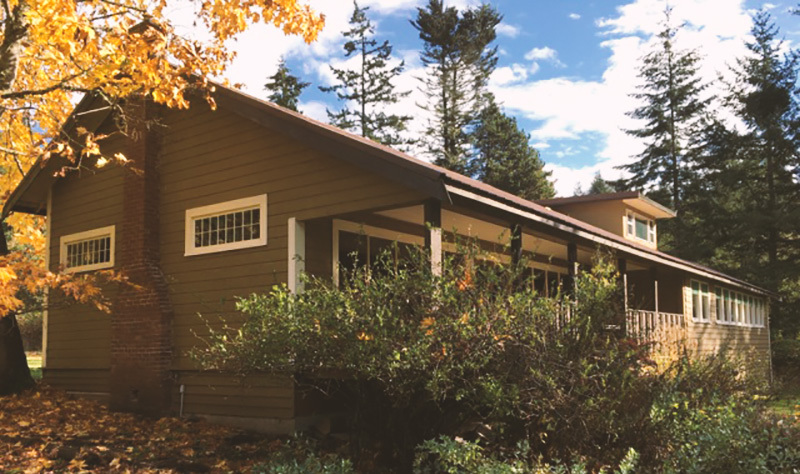 Today, the lodge hosts our commercial kitchen where groups can have food catered and have access to: accessible washrooms, a dining area for at least 80 people, a large meeting area featuring a stone fireplace, and a deck boasting a beautiful view of Tribune Bay. We have three camping areas that each provide private tenting areas, pit toilets, and a wash-up area with potable cold water. Each area has access to a large cookshelter that includes a cooking and eating area, and a lockable food storage area with a refrigerator. Each site also includes separate beach access paths and a central meeting area with a firepit. We have four varieties of cabins to stay in at TBOEC, plus three small cabanas. Each cabin has mattresses and either bunk-beds or platform bunks. Skylight Cabins: Two heated cabins designed to sleep 14 people each, with a separate room for leaders and an additional room for washing-up. These cabins are wheelchair accessible. Crow Cabin: A heated cabin that can sleep 14 people with a separate room for leaders. Running water is accessed with a full washing-up area behind the building. Pizza Hut Cabin: This cabin gets its name from its uniquely recognizable roofline, but there’s no pizza served here. This heated cabin sleeps 10-14 people and features a small kitchen and bathroom available for small groups who want to cook their own food. Yurts: These two unheated, circular cabins sleep 10 people each and create a unique camping experience. Cabanas: The cabanas are nestled near the Crow Cabin and can sleep 3-4 people each. The cabanas are unheated but cozy under the warm summer sun.